Invited & sponsored by the Goethe-Institut of Thessaloniki, for the 15th BJCEM-BIENNALE DES JEUNES CRÉATEURS DE L’EUROPE ET DE LA MÉDITERRANÉE 2011. Das Dogma der entrückten, unantastbaren Kunst als einzige mögliche Manifestationsform gehört schon länger der Vergangenheit an und wird immer stärker durch einen Ansatz ergänzt, der Interaktivität und Partizipation in den Vordergrund stellt. Der Versuch, Kunst durch die Einladung zur Mitgestaltung leichter und intensiver erfahrbar zu machen, gewinnt zusehends an Popularität und fördert immer neue Spielarten zu Tage. Partizipative Kunst positioniert sich damit als ein Gegenpol im Dreieck aus der kontemplativen, pädagogischen und der distanzierten, inhaltslosen Form und stellt in dieser Konstellation den einladenden, selbstgestalterischen Eckpunkt dar. 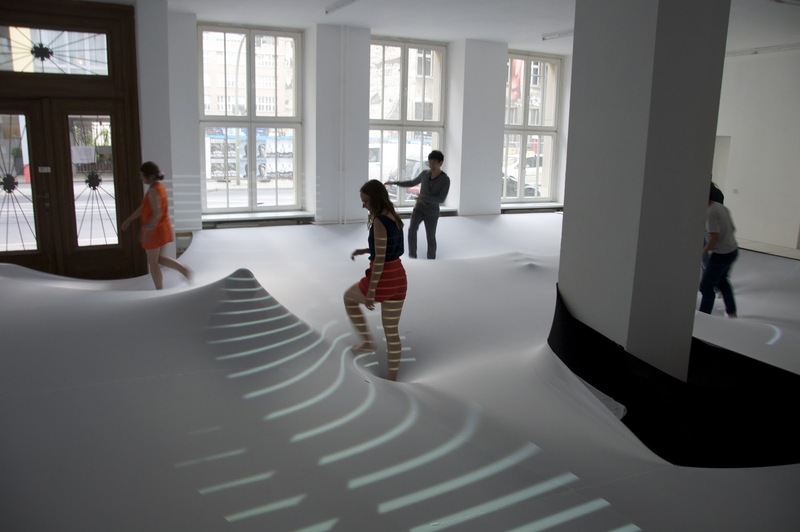 An exceptional and experimental installation took place last January at the Diamantenboerse exhibition space in Frankfurt. The corner gallery was fully covered with 100m2 of white elastic textile, tensioned in order to introduce a new ground extruded over the original floor. This installation functions as a morphogenetic tool, exploring potential spatial qualities. Visitors could enter the space and “play” with the white surface. The later becomes a dynamic topology, constantly generating new morphologies and spacial variations, always within the predefined envelope. 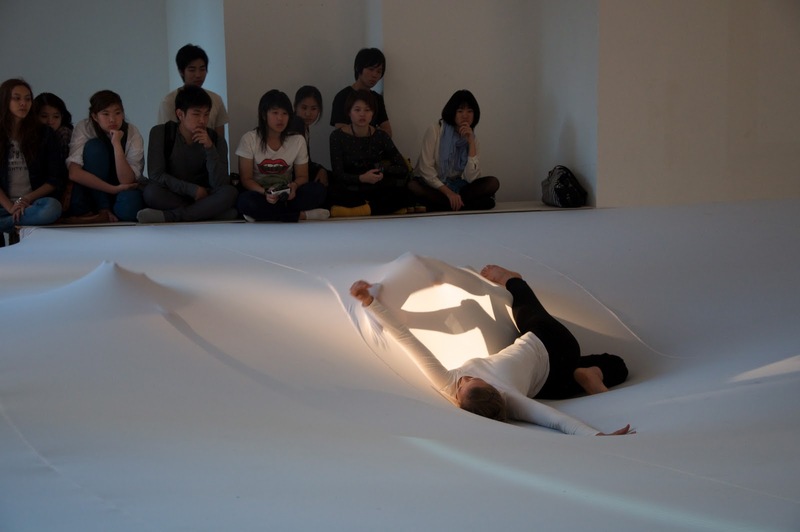 As an over-scaled bed sheet, this white surface, splits the room in two, while visitors can enter the space beneath or above, and interact. Despite the ‘splitting’, new ways of spatial connections and communications appear via the human bodies. 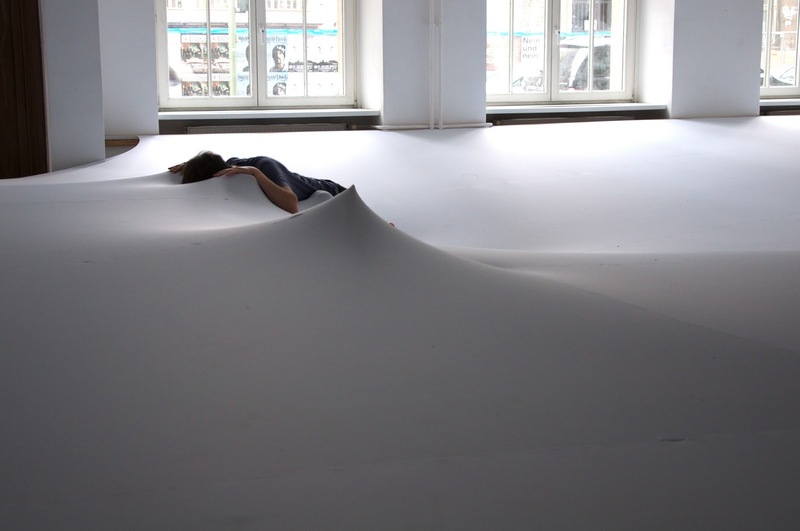 Users have to navigate themselves through different spatial and material conditions, where all senses are involved. Laser lines are projected on the membrane -as isocurves - mapping every change on the surface of the white landscape. The body is the protagonist as its movement indeed orchestrates the whole. When does an architectural model become a sculpture? 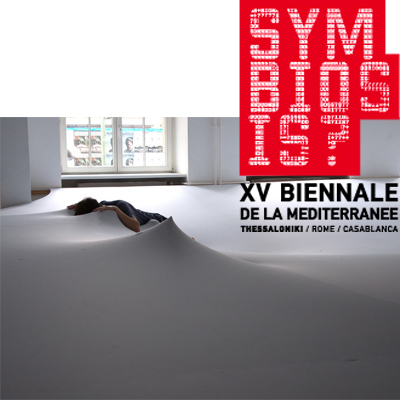 How could one experience a gallery space as a white cube or as a spatial installation itself ? How to shape space only when people interact with it? 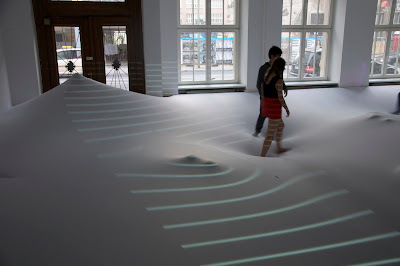 A white membrane disconnects and ungrounds the floor of the gallery. 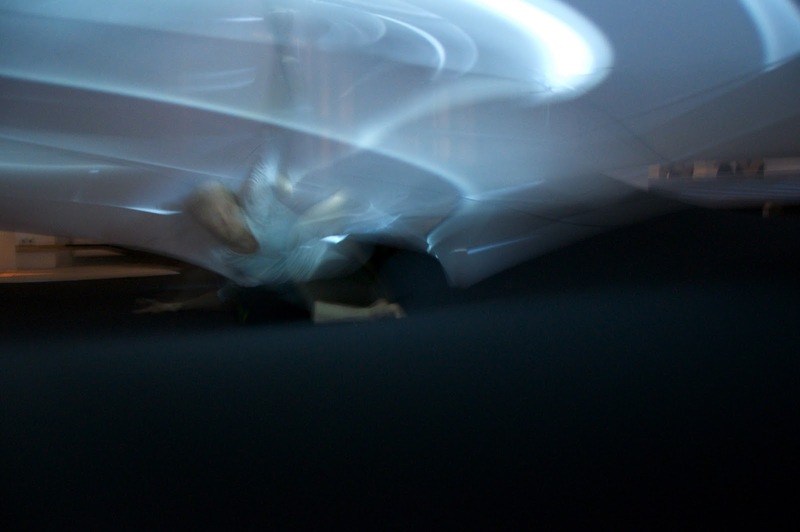 an interface of the virtual relation between the projected lines and the moving figures. An ephemeral sculpture that is ever the same.